Senate Majority Leader Mitch McConnell has previously said that he wouldn’t bring legislation to a vote in the Senate that the president wouldn’t sign. But the senator from Kentucky announced on Tuesday that he will force a vote on the giant effort to tackle climate change and overhaul the economy known as the Green New Deal. Have rising sea levels and worsening forest fires convinced the Republican leader to reassess his position on climate change? Not quite. McConnell is eager to get Senate Democrats on the record about their support for the resolution introduced last week by Senator Ed Markey of Massachusetts and Representative Alexandria Ocasio-Cortez of New York. Republicans see the proposal as a big liability for Democrats, portraying it as a socialist plot to ban airplanes and cows. It’s the old red-baiting line of attack. The proposal includes progressive agenda items like universal healthcare and a federal jobs guarantee. An outdated and since taken down FAQ on AOC’s website confused things by promising economic security for those “unwilling to work.” For the likes of McConnell, that sounds like the kind of left-wing proposal that could alienate moderate voters and give President Donald Trump a boost in the 2020 presidential election. Trump is already testing out this approach. “I really don’t like their policy of taking away your car, of taking away your airplane rights, of ‘let’s hop a train to California,’ of you’re not allowed to own cows anymore!” he said of the Green New Deal at a rally in El Paso, Texas on Monday night. 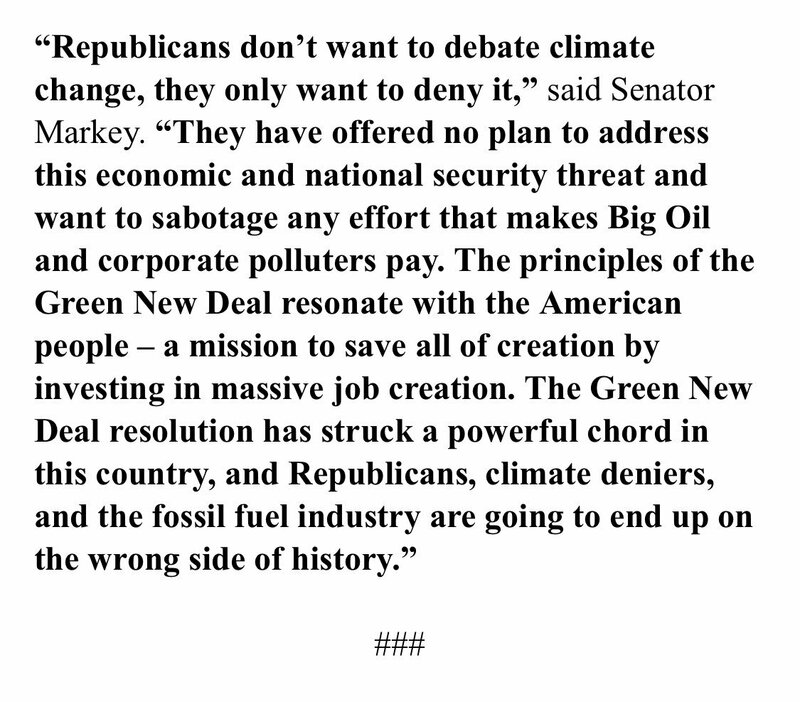 Markey quickly hit back at McConnell on Tuesday, releasing a statement blasting Republicans for failing to have a climate plan of their own. “The Green New Deal resolution has struck a powerful chord in this country, and Republicans, climate deniers, and the fossil fuel industry are going to end up on the wrong side of history,” he said. Ocasio-Cortez issued her own rebuke hours later. “McConnell thinks he can end all debate on the Green New Deal now and stop this freight train of momentum … all he’s going to do is show just how out of touch Republican politicians are with the American people,” she said in a statement. It’s hard to say whether McConnell will be successful in his bid to rattle Democrats on the fence about a resolution that promises so much so quickly. But the majority leader, and the rest of the GOP for that matter, might be too hasty in thinking it’s an Achilles heel for Democrats. The deal is gaining popularity in the House, where more than 15 percent of representatives have signed on as sponsors. And it’s picking up momentum in the Senate, too, especially among White House contenders such as Kamala Harris, Cory Booker, Elizabeth Warren, Amy Klobuchar, and Kirsten Gillibrand. Whatever happens next, it’s becoming increasingly clear that the Green New Deal is turning into something the two parties think they can use to their advantage.